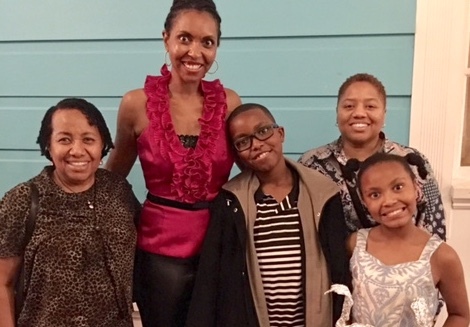 Guest post by the lovely Adrienne and her family! This year I decided I wanted to do something different for the holidays. I didn’t have a clear direction that I wanted to go but I knew a cruise ship would be a great addition to any possible holiday plans. I began preliminary planning earlier in the year, found out Norwegian sailed from New Orleans and my decision was instantly made. 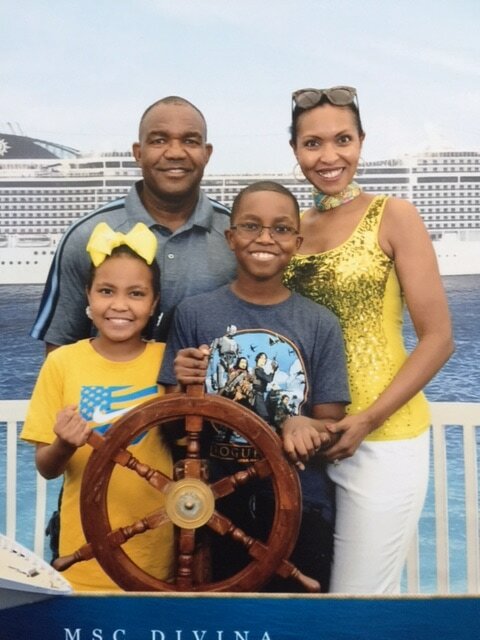 We are a family of four and decided to invite our extended families to join us for Thanksgiving on the sea. 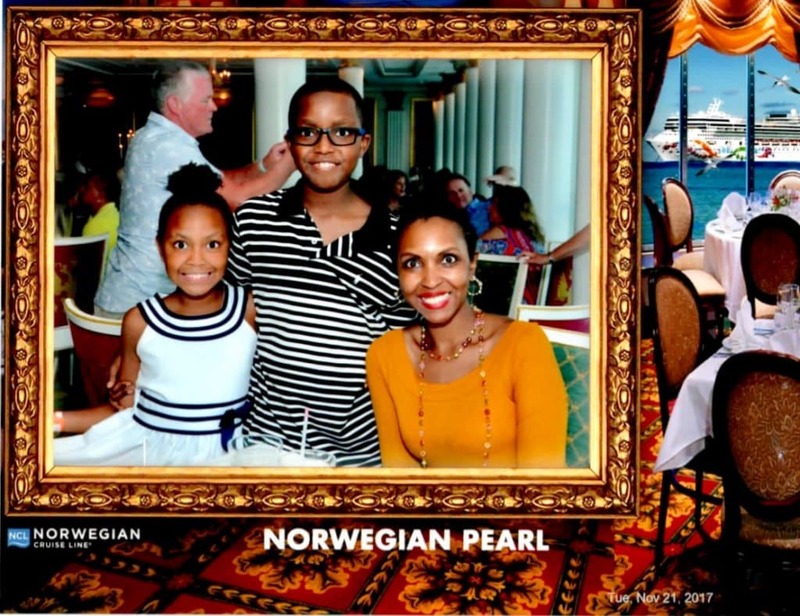 This was my parents first cruise, me and my kids first Norwegian cruise, and my in-laws second Norwegian cruise. Unfortunately, my husband could not join us due to last minute work obligations. Someone inquired about ‘my favorite cruise line’ earlier this year and I replied I did not have one. After the shocked aghast expression I received, I made it my personal mission to sail the various cruise lines and find my personal favorite. I was super excited to try Norwegian and see if it would step into the first-place spot. First, learning that the ship set sail from New Orleans was such a major perk. I mean, who doesn’t just LOVE New Orleans, right?! We drove to New Orleans on Friday to spend a couple of days relaxing and sightseeing before boarding the cruise. While in town, we embarked upon a delicious food tour with Destination Kitchen that was worth every minute and every calorie. We also enjoyed dining at Port of Call and Commander’s Palace while in town and would highly suggest a visit to both should your travels take you to the Big Easy. We awoke excited for embarkation! What cruiser doesn’t become jubilant and gleeful at the prospect of moving into your new home for the week? We signed up for late embarkation as we were a big group with quite a few non-morning people in tow. After a midmorning breakfast, we caught an Uber to the port from our hotel room and happened upon a very long line. This embarkation proved to be the longest and most chaotic of any cruise I had taken to date. 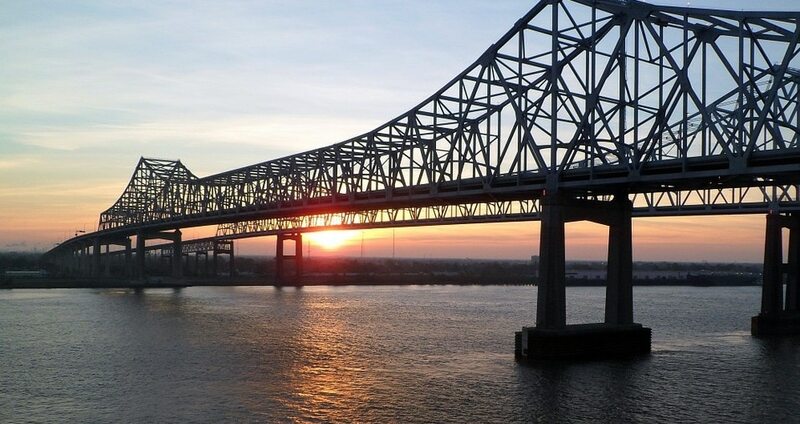 We later learned that given the traffic along the Mississippi River and a late arrival of the Pearl from the prior cruise, there were major delays with boarding the ship. 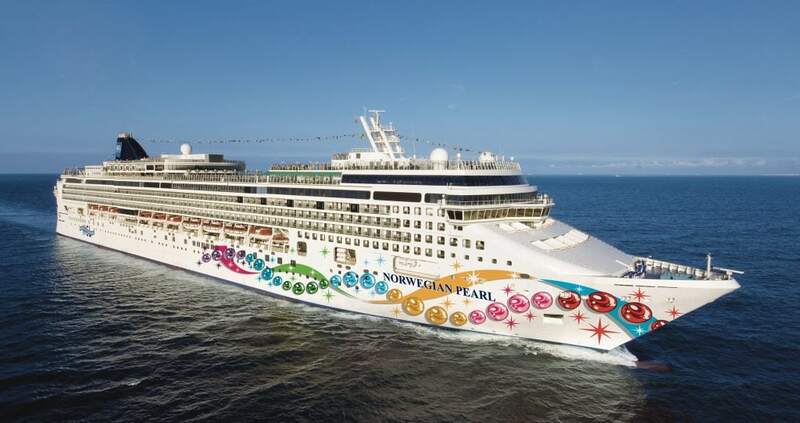 Though these factors were outside the control of Norwegian cruise lines, there were many concerned passengers in the terminal. We finally got through the boarding process after checking in and getting our sign and sail cards. 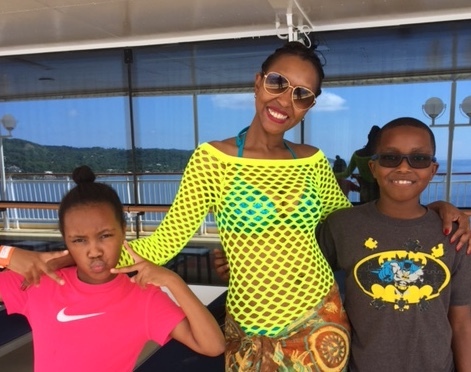 Immediately upon boarding a ship, we usually head for the lido deck for lunch as my family swears they are starving. On this cruise, since we embarked so late in the day, our cabins were already available so we went straight to our rooms to divest ourselves of our carry-on bags. We’d already eaten, so gladly we didn’t need to head to the buffet immediately upon embarkation as is our normal cruise tradition. We walked around exploring the ship and were soon summoned to our muster stations for our drill. 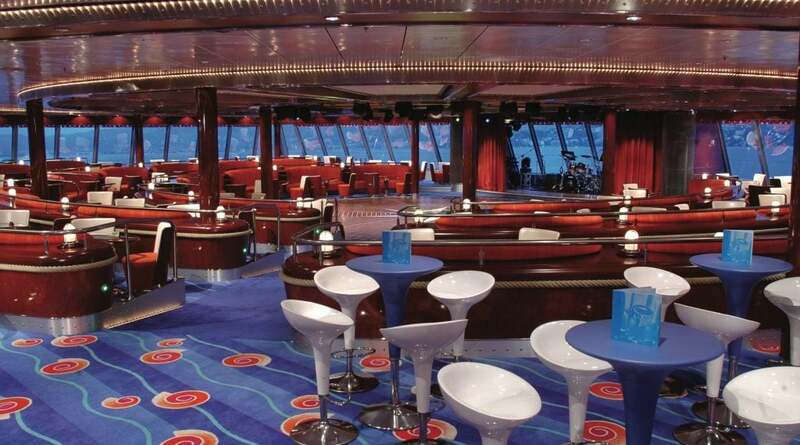 Norwegian was the first cruise line that I remember being able to go inside a venue and sit down during the drill. The last few cruises we’ve taken we have been required to line up on the deck and listen to instructions. Norwegian (NCL) allowed us to relax inside Le Bistro and await further instructions. Once the drill was over we returned to our room to relax and unpack for the week before heading off for dinner. The Pearl is a midsized ship for NCL and was a very comfortable size for navigating with ease. 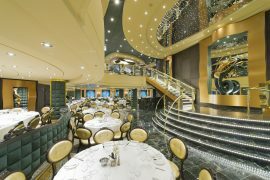 The ship was recently refurbished and had plenty of storage space in the staterooms, along with numerous bars, lounges, nooks and crannies for relaxing or having snacks or drinks with friends. The Bliss lounge, on the 7th floor, was the site for bowling, karaoke, games and slots. We stayed on the fourth floor and the remainder of our family was on the eighth floor, much to the chagrin of my children. My family rule for cruising is simply no elevators. Since cruises are fraught with delicious rich foods laden with calories, I insist upon all of us taking the stairs anytime we need to travel around the ship. Our extended family refused to cooperate initially but when they saw all of us consistently doing it, they joined along. However, they’d only walk down the stairs with us, never up. The Pearl had a very colorful, lively scheme. 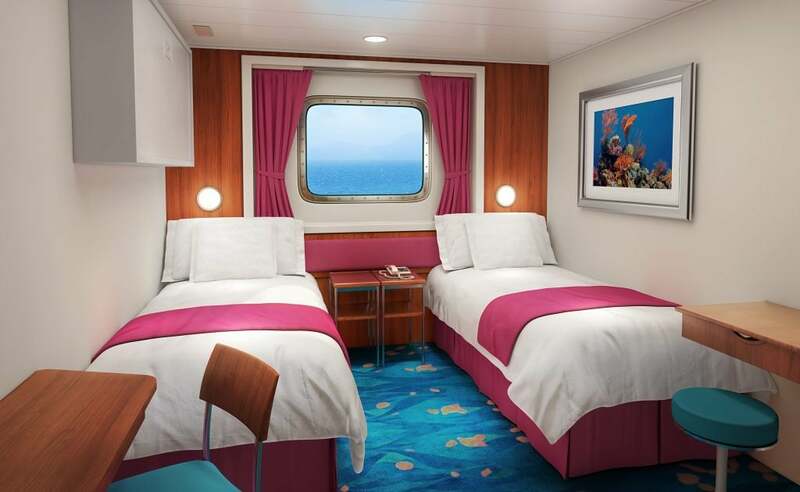 All of the cabin doors were turquoise in color and the overall feel of the ship was an energetic beach vibe. The carpeting in the halls had red and blue fish to signal the direction you were traveling on the ship. The red fish were pointing aft and the blue fish were pointing forward. This helped keep us from getting confused while initially learning the layout of the ship. The pools were plentiful and large so everyone had more than enough space to swim. There were two large pools and four hot tubs on the deck. The water in the pools was freezing cold and I definitely did not want to stay very long. The pool depths were marked as being shallow enough for me to stand. However, at 5’10” I was definitely treading water instead of standing. This unexpected workout definitely contributed to the overall calorie burn I was enforcing with our incessant stair climbing. There was a grill near the pool for burgers, fries and such if anyone needed a quick treat while swimming. 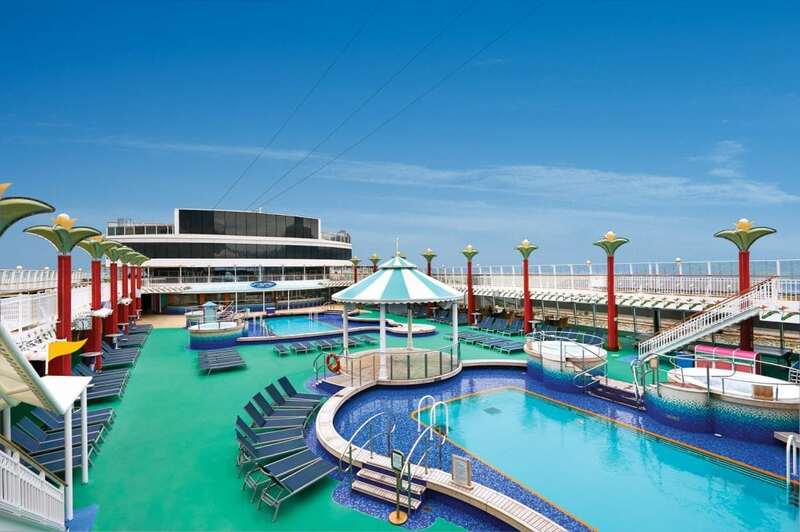 Deck 12 was where the majority of people congregated. This was the true hub of the ship. The buffet, kids club (Splash Academy), library, spa, fitness center, game/card room and portrait studio were all on deck 12. The fitness center was well equipped with plenty of treadmills, stationary bikes and free weights. I did not utilize the spa although my neck was quite stiff by the end of the week so I would’ve loved to get a massage. However, the fees were exorbitantly high so I opted out and decided my stiff neck would just have to wait. The Stardust theater was somewhat small in size and felt somewhat dark and closed off. There was no center aisle, only outside aisles in the theater. If arriving late to the show, you would likely need to disturb an entire row of people to get to an inside seat as most of the outer seats fill up first. 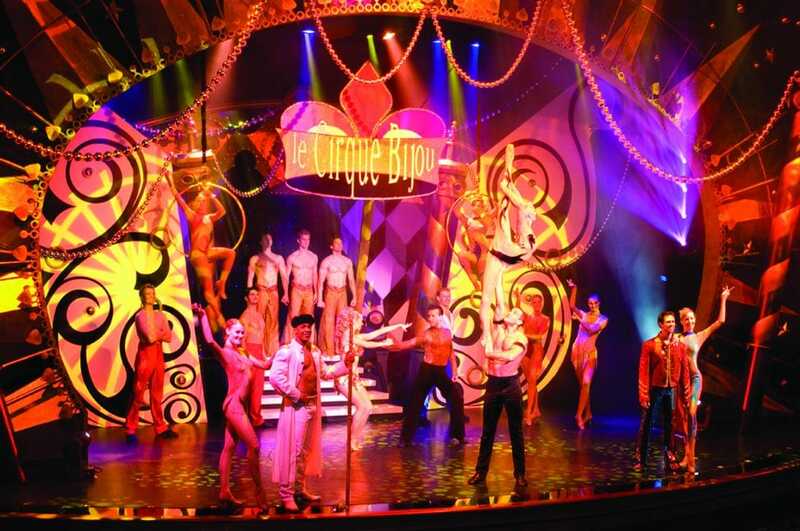 We did not attend any of the performances but we popped in a couple of times to see the shows already in progress. Additionally, on the final sea day, the Splash Academy put on a circus with the kids who attended the programs throughout the week. We attended this show and thought the team did a phenomenal job working with the kids to put together a fun performance. The main atrium was open and spacious with a large screen and a coffee bar. O’Sheehan overlooked the atrium for anyone who wanted to grab a bite while participating in or watching the entertainment that often occurred in this open area. As my first review was for the MSC Divina (you can find that here), I wanted to take a moment to compare and contrast the two vessels. These two ships as well as the two cruise lines differed enough that it is difficult to find similarities between the two. The Pearl was a very casual, family-oriented atmosphere geared towards shorts and flip flops. Aside from Summer Palace and Le Bistro (which I did not eat), there was no dress code on the Pearl. The atmosphere allowed everyone to feel comfortable in anything they chose to wear. Whereas the Divina was a very elegant ship. The crystal staircase and the art niches throughout gave an air of class and opulence to the overall feel of the vacation. Though there was not a strictly enforced dress code, most people chose to dress for formal night, white night and the other themed nights aboard the Divina. We stayed in an ocean view cabin on both sailings. 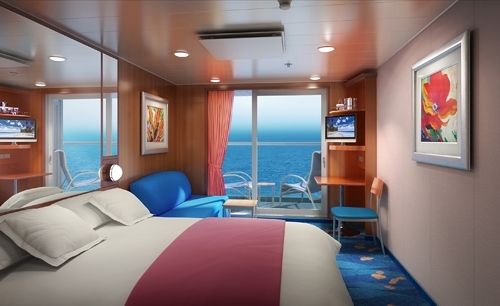 On the Divina, our room was beautifully decorated, relatively spacious and had a sitting area with chairs and a small table. The 3rd and 4th passenger beds folded down from the walls directly overhead. The shower had collapsible plexiglass doors that allowed more room when the shower was not in use. However, the NCL Pearl was my favorite cruise ship bathroom to date! Upon entering the bathroom, the sink was in the center while the toilet was on one side and the shower on the other. Both the shower and the toilet were separated by sliding glass doors to allow privacy and for multiple people to use the space if necessary. This idea was pure genius for family style cruising! The sleeping arrangements allowed space during the day by storing a 3rd passenger trundle bed under one side and a 4th passenger fold down bed from the wall above on the other side. Cabin storage space was plentiful on the Pearl and allowed for many of the comforts of home while away on vacation. If you’ve never participated in a meet and greet then you are missing out. I love all things blog and travel related. I scour Facebook forums, cruise critic posts, Vlogs/Blogs and Trip Advisor to glean any information that I can gather leading up to a trip. While doing so earlier this year, I learned that other cruisers chat with people on their sailing in preparation for the trip. Let’s face it, no one other than someone else going on the trip with you is as excited as you are about your upcoming vacation. Quite honestly, my family and friends get tired of listening to me share my excitement about upcoming travels. As such, these forums are the perfect place to count down the days to embarkation with a group of people just as excited as me! We chose the dinner package for one of our perks with the cruise line. We selected Moderno, Cagney’s and La Cucina. All the restaurants were good but if I had it to do over again, I’d cancel La Cucina to try Le Bistro. Moderno is for the consummate meat lover. If you have a hearty appetite and love meat, this is the place for you. It’s the same concept as Texas de Brazil and had my husband been onboard he would’ve given it two thumbs up. Cagney’s steakhouse was also deliciously divine and we would highly recommend it as well. While I liked La Cucina, I didn’t love it and my family was quite apathetic about it as well. However, food is subjective and another family may love it. We also dined at Indigo, Summer Palace, O’Sheehan, the Sushi Bar and the Garden Café (buffet). I absolutely loved Summer Palace and could’ve eaten every meal there. It was so reminiscent of old-style cruising as it was one of the only restaurants on board that had an enforced dress code. Though NCL is freestyle cruising, Summer Palace was beautiful and classy in décor and they required their guests to match the style of their venue. The menu is the exact same in Indigo (the other main dining room) and allows passengers to enjoy the same food without the hassle of trousers, makeup and curling irons. The only downside (in my opinion), to the freestyle dining of NCL is that it reads as slightly hectic during peak dining times. Many times, while walking near the dining room, there were lines of people trying to get into the various venues for meals. Even on the night of our Moderno’s reservation we waited for nearly thirty minutes before we were seated. However, we were on vacation so this definitely wasn’t a deal breaker for us. My family LOVED the buffet and it was their first choice for meals and a frequent pit stop or meeting location for our group throughout our trip. My husband is a consummate buffet lover and I am the complete opposite. I was simply giddy with the idea that I’d never have to step foot in the buffet since he would be unable to make this cruise. Much to my amazed chagrin, my entire family wanted to have the majority of our meals there. Although I balked initially, the sing song tales of “washy washy happy happy” by the greeters at the door along with guitar medleys of “I wanna wash your hands” brought such a smile to my face that I found myself smiling and singing along. I received an invitation in my cabin for dinner with one of the ship’s officers. The training specialist, Ana, was hosting a group for dinner in Summer Palace. The evening was lovely and there was a nice group of other invited ladies who all gathered together for the dinner. We were able to ask questions about the ship, inquire about her life spent at sea while enjoying a yummy dinner and fun dressed up girls’ night in my favorite dining room. My children, who deem themselves cruise kids’ club connoisseurs, absolutely loved Splash academy! My son stayed in kids’ club for 8 hours one day declining our offers to take him to lunch or dinner. We literally had to force him to leave when it was time for us all to go to bed. On the last sea day, Splash academy puts on a show with all the kids who participated in the program. It was super cute and so good to see how the kids bonded with new friends made aboard the ship. Although they swear by Carnival’s kid’s club as the best kid program at sea, they both wanted to know when we’d be sailing NCL again. Looks like these kids have a second favorite cruise line. Carnival still takes the lead as the favorite kids’ club because they have a free game room that includes Xbox, PS4 and a Wii-U. The only thing that was challenging about Splash Academy was the frequent break times. The club closed for a couple of hours multiple times throughout the day. Though I never mind spending time with my children, these frequent breaks forced me to carry my phone and set alarms so I would be sure to pick them up on time. I was often seen sprinting frantically across the ship to grab the children when I was having so much fun that I didn’t hear my alarm chirp on my cell phone. OOPS! 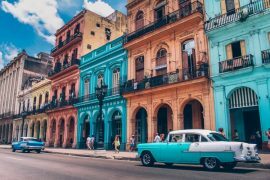 This itinerary had a sea day at the beginning and the end and stopped in Cozumel, Mexico; Roatan, Honduras; Harvest Caye, Belize and Costa Maya, Mexico. We enjoyed every single port day to the fullest. In Cozumel, we booked an excursion through Viator with Tours Plaza and got an amazing private driver named Enrique. Our driver customized our day on the island to places we wanted go and things we wanted to see. We had lunch at Punta Morena and finished our tour with time relaxing on the restaurant’s adjacent beach. We went ziplining while we were in Roatan! We also booked this tour through Viator and we loved it. The ziplining course was about two hours. The guys who went with us were so fun and made sure we all had a great time. For the younger kids, they would zipline in tandem to make sure they weren’t afraid and could make it all the way to the other side. Following our ziplining we were able to spend time on the beach relaxing and playing in the cool water. The only downside of this day was that it was a tender port and it took seemingly forever to get off the boat that morning. They had us go to the lido deck at 10am to get tender tickets to learn the order you were to disembark. We arrived at five minutes before 10am and we were already in group 9. Again, this wasn’t the end of the world as we had the entire ship to entertain us until our tender was called. Harvest Caye is a new, private island owned by NCL. The beaches were beautifully pristine and there were so many activities that you could do while you were there. Since this island was privately owned, the Pearl was the only ship in port that day so we had the entire island to ourselves. This was by far my favorite port! We went to Maya Chan this day and I cannot say enough about this private beach! It was simply the best! Maya Chan is beautiful and privately- owned. There is a limited number of people they accept each day as there are only a few bungalows. 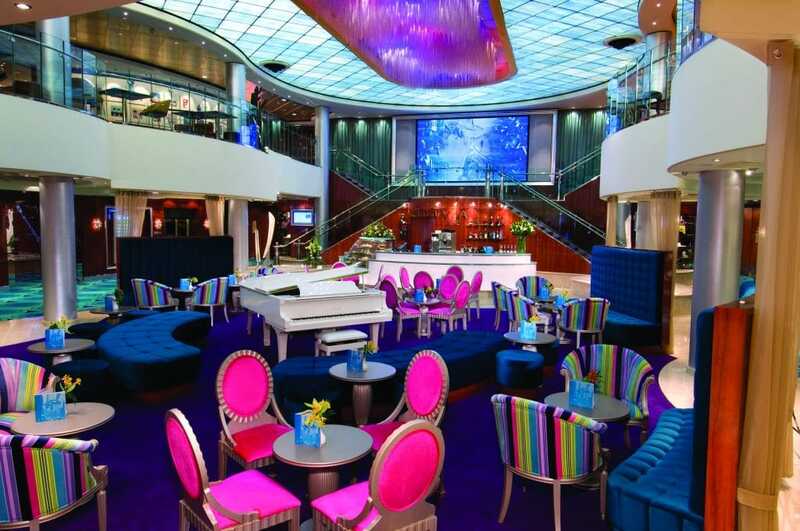 All drinks, snacks, a delicious lunch, water toys and transportation to and from the ship are included during your stay. We were so sad to see our time at Maya Chan end. 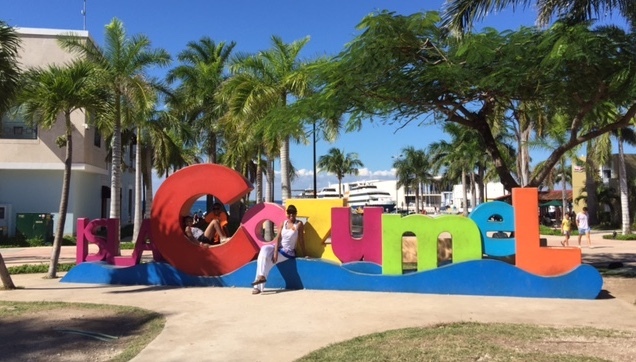 Should our travels bring us back to Costa Maya, Maya Chan is the place for us! Sadly, all good things must come to an end. We disembarked and made the sad journey into the terminal to collect our bags and return home. We definitely enjoyed Norwegian tremendously and will absolutely sail with them again. We’ve alread booked to sail with them in a few years. The verdict is still out on who will be my favorite cruise line but it has been a fun journey to find out. Stay tuned! I am so glad that you had an amazing time! As you all know I love NCL and am happy to hear that you did too. 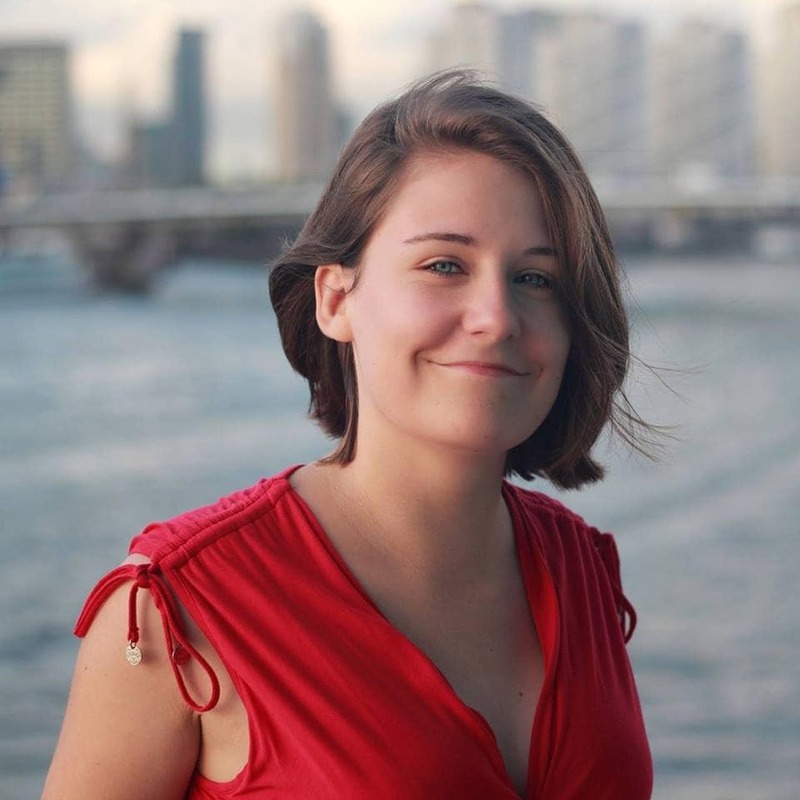 It sounds like you made a lot more of the destinations than I did when I visited a couple of years ago on the Norwegian Getaway… I’ll definitely bear your advice in mind if I am ever lucky enough to return. 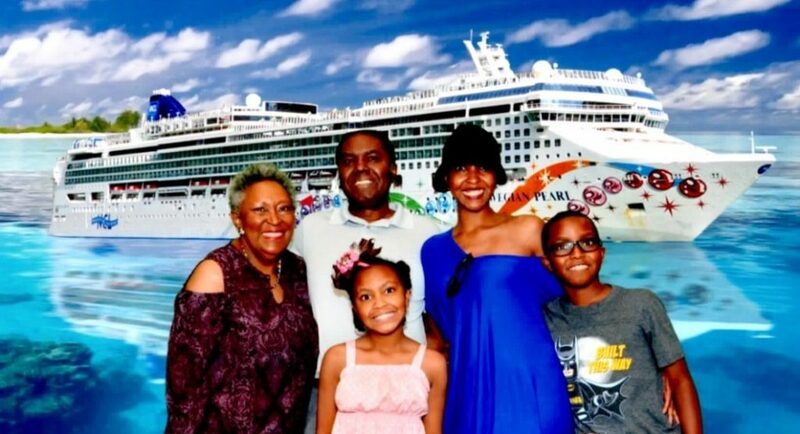 Adrienne and her family have cruised on the Carnival Jubilee (2001), Celebration (2003) and Freedom (2016), Royal Caribbean Serenade of the Seas (2006) and Enchantment of the Seas (2017), Peter Deilmann River Cruise (2008), Holland America Nieuw Amsterdam (2013), MSC Divina (2017) and the Norwegian Pearl (2017). They are currently looking forward to cruises they have booked on Disney, Princess and Celebrity.